Students will be able to recognise colour words and determine whether certain objects are real or pretend. Show students your Halloween mask. Put it on and ask the class if they think you're scary. Ask them whether you're really what the mask is (e.g. whether you're a real goblin) or just a pretend version. Discuss RealVs. Pretend, or actual vs. fake, while presenting your real and pretend props. For example, show students how a real orange is edible, while a plastic, pretend orange is inedible. Explain that on Halloween, people dress up to play pretend. Read your Halloween-themed book aloud to the class. Ask students to determine whether certain things in the story are real or pretend. Discussion questions will depend on the book you choose, but could include questions like: Is this child in a ghost costume a real ghost or a pretend ghost? How can you tell? Read Brown Bear, Brown Bear, What Do You See?Aloud to the class. Ask students about whether the things in the story are real. Great discussion questions include: Are horses really blue? Are cats really purple? Using the Paper Crayons, review various Colour words. 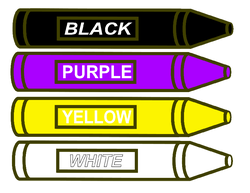 Show how each colour word denotes a different colour. For example, compare blue to the sky and green to grass. Hang the Paper Crayons in view of the children. Show the class the pumpkin. 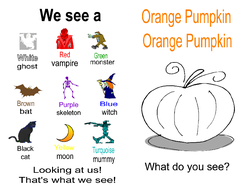 Ask your students to tell you the colour of the pumpkin. Hand out an Orange PumpkinBooklet to each student. Read the cover page of the booklet to the class. Ask students to find orange crayons and colour the pumpkin on the next page. Turn to the following page and read it aloud. Ask students to find the colour that goes with that page. 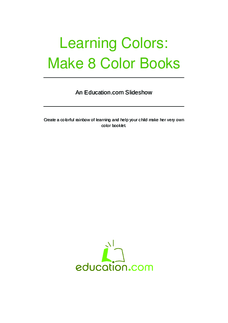 Repeat the process for the rest of the pages, encouraging students to read along. For the last page, ask for the entire class to read along. Ask students which things are real and which are pretend. Give them the answer for each one. The things that are real are: a cat, a bat, a moon, a pumpkin, a skeleton, and trick-or-treaters. The things that are pretend are: a vampire, Frankenstein, a mummy, a witch, and a ghost. Have each student sing the following song to the tune of Farmer in the Dell. I will be a [costume]! Put on your mask and include yourself as the last singer. 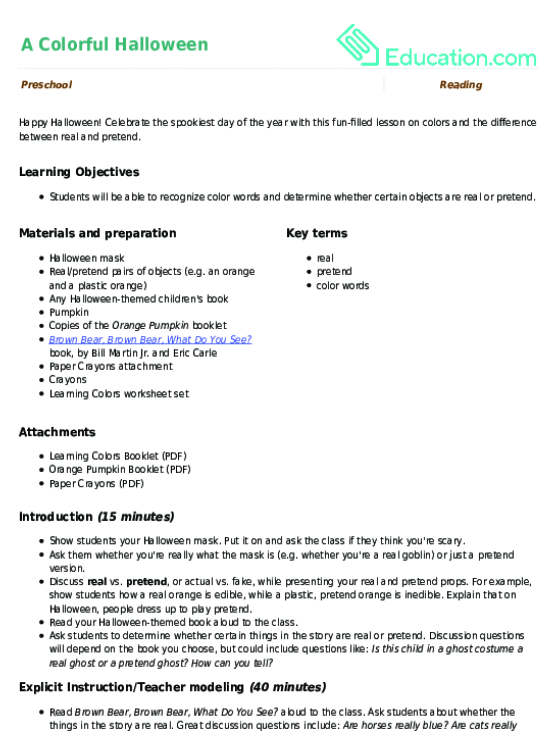 Have students read the Orange PumpkinBooklet on their own. 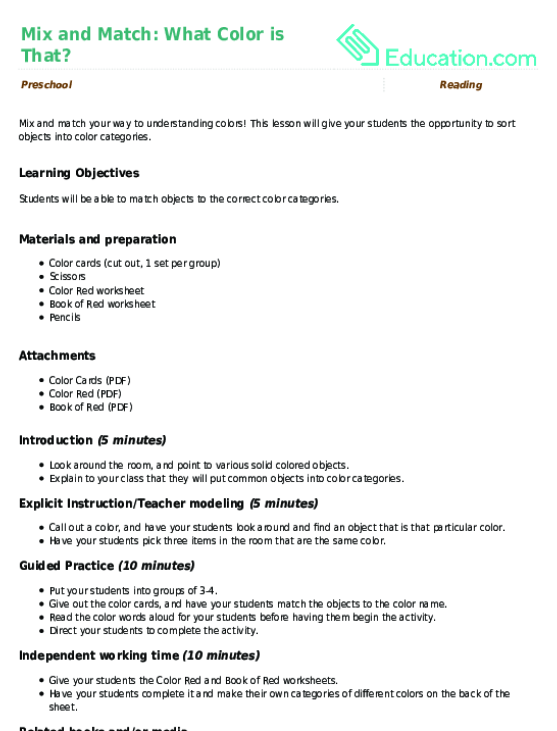 Enrichment:Have students in need of a greater challenge work on the Learning Colors worksheet set. Support:Have struggling students work alongside more advanced classmates for peer assistance. While discussing real vs. pretend, take note of which students understand the concept. Observe students during Independent Working Time in order to assess the class' grasp on the booklet's contents. Review colour words by having students read aloud the words on the Paper Crayons.